There are currently 94,917 users on this website. Brazil KM#556a Die Errors ? What types of die errors are here? This coin from Brazil KM #556a has some die errors. Coin on the right is a non error coin for reference. 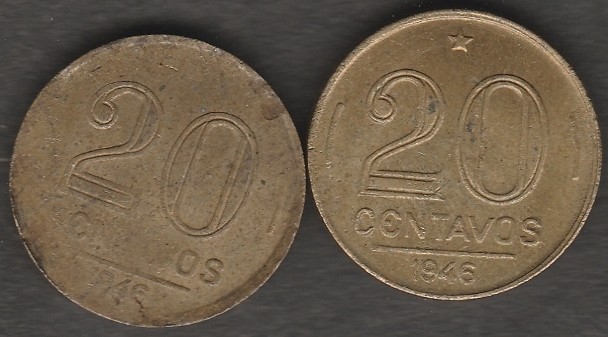 The left coin is the error coin. How many different errors are there and what are they called. I know nothing about such errors, so all information is welcome. @htx, on the reverse of the left hand side coin, a grease-filled die may have contributed to the light strike and missing details (e.g. the star at the top). 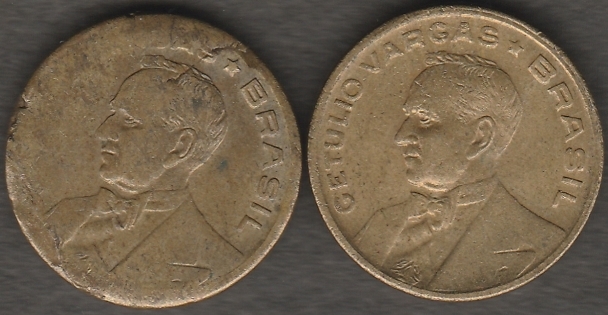 The front of this coin looks a bit damaged to me and I'm inclined to think that the loss of detail there is due to flattening, which is especially evident on Vargas' nose and forehead. So this is a combination of a flawed planchet being struck by a grease filled die. Thank-you Spence and jdmern for your replies.